Goode’s Company Captures a German Machine Gun in 2010. It was malfunctioning, but we don’t tell that part over drinks. 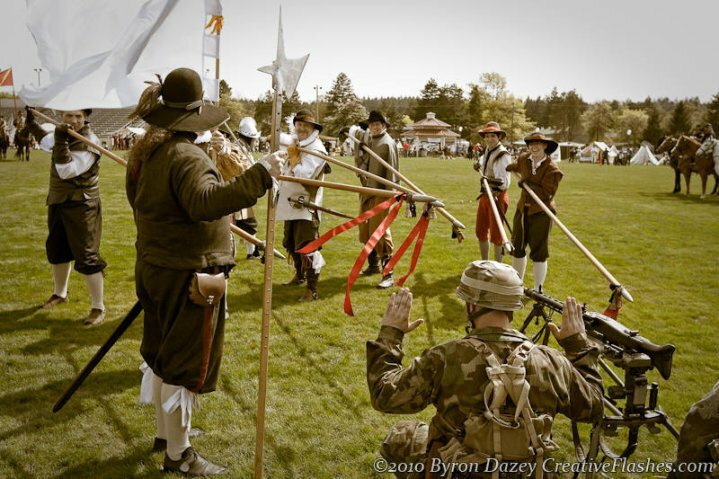 On May 18th, Goode’s Company will join a number of other historical education and reenactment groups at the Armed Forces Day celebration at Joint Base Lewis-McChord. There, we expect to see old friends, do some training, bring members of the public into our ranks to learn pike actions, and generally look for mischief including the traditional “Grande Melee” wherein we take the field with Romans, Civil War reenactors, the Wermacht, and turn-of-the-last-century RoughRiders in an awesome and surreal cross-time mixup (in which we generally get wiped out pretty quickly by the guys with machine guns).